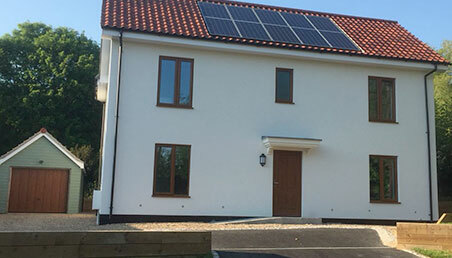 Beattie Passive are partnering with Housing Associations and Developers across the UK to set up their own Beattie Passive Flying Factories and build Beattie Passive homes with their own labour and supply chains. The organisations below have received Flying Factory training in order to set up their factories and learn how to build the Beattie Passive system. 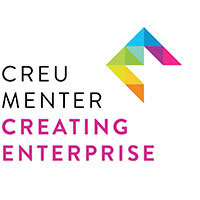 Creating Enterprise is a wholly owned subsidiary of Cartrefi Conwy Housing Association. The organisation was set up as a Social Enterprise providing a wide range of property maintenance activity to both private and public sector, reinvesting profits to give those furthest from the job market work place opportunities. They are now embarking on an ambitious development programme of quality, affordable homes across the North Wales Coast. Creating Enterprise are the first Welsh organisation to set up their Beattie Passive Factory to start manufacturing a number of small developments across North Wales. Andrew Bowden - CEO at Cartrefi Conwy said "Beattie Passive not only deliver high quality Passivhaus homes, they also actively engage with the local community to bring vital skills and education in construction. These values run parallel to our own and having outlined our housing objectives, it was clear that a Factory would be hugely effective in helping us to achieve them. We look forward to a long and productive relationship with Beattie Passive." The Toolshed is part of a social enterprise education provision managed by The New Meaning Foundation, part of a not-for-profit organisation. The Toolshed teaches and encourages young people to learn new skills and help them develop confidence, self-belief and to gain life skills. Beattie Passive has provided training for 5 young people at their Training Academy in Norfolk on a workshop-based training course. 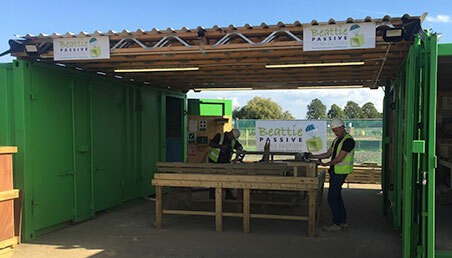 Following on from the workshop based training, the trainees developed their skills on-site though erecting structures for Beattie Passive and will next set-up their factory in order to deliver units for Vale of Aylesbury Housing. 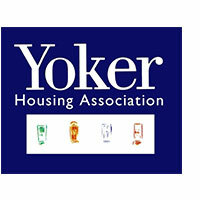 Yoker Housing Association is a small community based Housing Association in Glasgow. Designs are underway for 15 new bungalows and cottage flats on the former Blawarthill Hospital site, Glasgow. These will be manufactured in a local Flying Factory by a social enterprise, Community Workforce Partnership, who train hard-to-reach 18-24 yr-olds. Wrekin Housing Trust and partners have just been awarded a £650,000 Government grant to provide a training hub aimed at providing opportunities for the unemployed, addressing Shropshire’s housing shortage, and boosting the county’s construction industry. The factory training hub will be equipped to focus upon learning skills used in the construction of Passivhaus homes. Known as the Marches Construction Ready Partnership the group which includes Beattie Passive, aims to introduce around 400 trainees to the construction sector, by training the long-term unemployed, students and people looking to make a career change into the construction industry. Stewart & Shields are a well-established contractor based in Helensburgh and operate across Scotland and selected areas of the UK. They have completed the Beattie Passive Flying Factory Training Academy and set up a flying factory to deliver their first Beattie Passive home for one our Self-Build clients in Braemar, Scotland.